On this day 200 years ago, Mary Ann Todd was born in Lexington, Kentucky. She went on to become the wife of Abraham Lincoln, and therefore eventually the First Lady of the United States. In 1832, Mary and her family moved into a brick home where she lived until she moved to Springfield, Illinois. 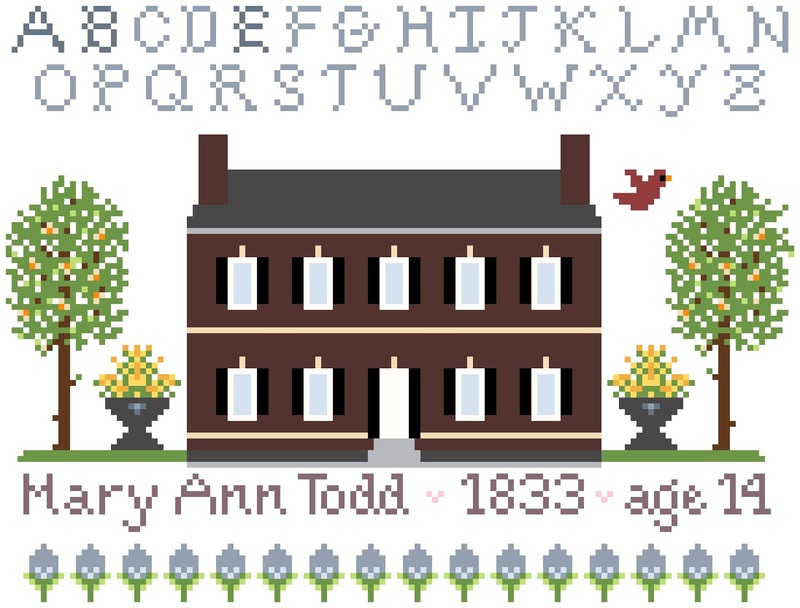 To honor the life of this very interesting woman, I have created a cross stitch chart in the sampler needlework spirit of 19th Century America. Many young ladies of the time practiced needlework as part of their schooling. 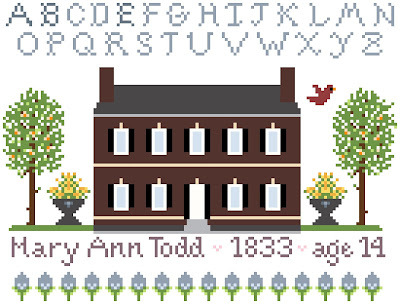 Taking some liberties, I designed this sampler by imagining what Mary herself might have created at the age of 14, having just moved in to this beautiful new home. Tulip trees are the state tree of Kentucky. The goldenrod is the state flower of Kentucky. The alphabet has a slightly darker A, B, and E (for Abraham's famous nickname). There are 16 teardrop-shaped flowers on the bottom row, denoting her marriage to Abraham (the 16th President) and the sadness that unfortunately visited Mary as a wife and mother. Of course, Mary wouldn't have known those details in 1833, but perhaps the threads she selected had some foreshadowing powers. So, I present to you my very first cross stitch design and I am offering it to you for free. All I ask is that while you're spending time with your needle and thread, give Mary a thought or two and maybe a "thank you" for being the wife of one of our greatest presidents. I hope you will enjoy stitching this as much as I enjoyed creating it. I designed this in all DMC colors. However, please feel free to use your own choice of floss if you would like a different look. I didn't have time to stitch a model (yet) but a natural linen/aida color would probably work best. The stitch count is 136 wide x 103 high. If stitched on a 14 ct. aida or a 28 ct linen/evenweave, the approximate size would be 9.75" wide by 7.375" high. Please use this very handy Cross Stitch Calculator to determine other sizes. Thank you very much for coming by. Please leave me a comment below if you have any questions and I will reply! © 2018 Susan O'Bryant. Simple theme. Powered by Blogger.